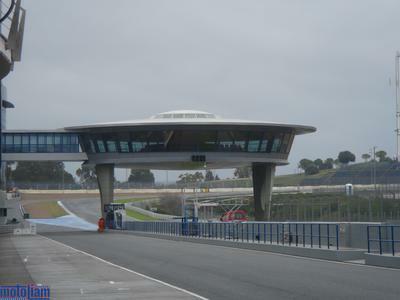 No real time to Update about the IRTA Test last week in Jerez, too many things happening and in a few hours I'm leaving for Qatar. Here are a couple images from the test, now it's time to get ready to Race! I meant to post this up when I noticed my website was on the fritz. "I managed to get ahold of my missing bag by Saturday night, and as Sunday rolled around I tried to concentrate on completely disconnecting from the Motorcycle world by taking a nice little spin on my Haro and consciously avoiding the heavy workload that I knew would ensue as soon I as took off for Jerez de la Frontera. It didn't really work, as I spent much of my afternoon replying to various emails and getting my paperwork in order for the IRTA test, which for me would begin at dawn on Monday. I flew out of BCN to Madrid, and then spent an hour at the team raceshop in Daganzo, Madrid, before loading up in a van with a couple teamates so that we could make the seven hour drive to Jerez. We stopped at a great roadside cafe/diner, Spanish-style, and then made it to the hotel by 9PM. For me, it was a little frustrating, because I wasn't able to get anything done while being jostled around in the back of the van, and aside from the rain, the only interesting thing to happen was a roadblock by the national police, which naturally led to us being pulled over and my bags being searched. Apparently, they're on the lookout for terrorists, and little ole' me was the only team member who fit the description, hahaha. 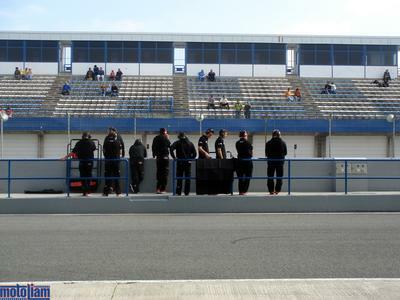 We started working at the track on Tuesday, a full day earlier than most of the MotoGP teams, so that we could assemble our new pit box and get a headstart on prepping the bikes for the test. It has been a mile-a-minute since then, but on the plus side, I've got my own trailer to myself, and when it's quiet I can really go to town and get some work done. Except, there hasn't been a moment of peace since we parked the Semi's, and so my multi-tasking will have to improve even more. There's so much to learn, and so many ways I feel I can make my mark, that I'm pretty excited about everything and I've definitely got my goals in sight for this season. 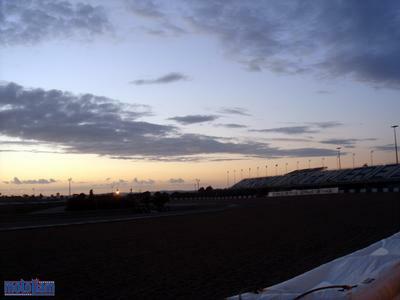 Another thing, and I've noticed it's affecting everyone, is that being around the Big Show has got us really psyched for the upcoming season, and it's really good to be surrounded by all the trucks and listening to the wail of the two-strokes as they make their test right now. The weather was pretty bad for riding on Tuesday, but today was much better, and I anticipate good temperatures this weekend. We've got a car on the line, and I'm sure The Hoff could use it. I just want what I always want - to perform to my full capabilities and continue growing. We wrapped up our first two nights here at a nice restaurant called Esteban's, and it was always full of the paddock people. Spotted KRSR and Chuck, Rossi, a bunch of 125/250 teams, and a host of GP squads, and since it's been a while since we've all seen each other outside of the track (since November for most of us), we enjoyed teasing one another and catching up. Tonight we finished up at 11:30, but it's all worth it to know that you're giving it your all, and your team is right there with you. At least I can say that I've got all my luggage this time around and the future is happening right now. I'm ready - because this is going to be another year where history is made, and my hands are in on it." For the first time in five years, there's a new rider gracing the permanent pass, 2006 MotoGP World Champion, Nicky Hayden! Red ones are for the boys in the garage, Blue ones are for team workers who are allowed in the paddock, but can't visit pitlane (like engine builders), Green ones are for hospitality workers (paddock only), and Orange ones are for Media people (paddock and pitlane I think, not completely sure). 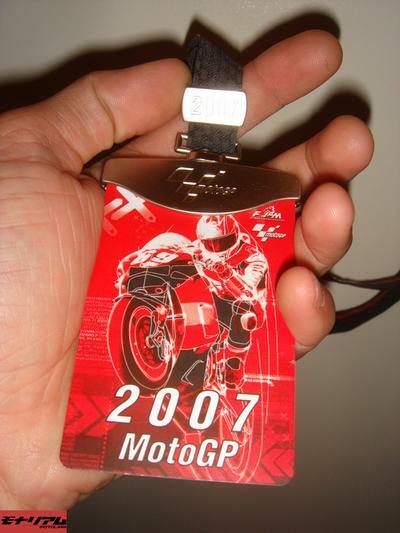 There are a couple smaller tags that get spread out on the lanyard for starting grid priviledges, and then there's the coveted "ALL" which means you can go anywhere and do anything. Select riders, team owners, past champions, those kinds of people get the ALL-pass. 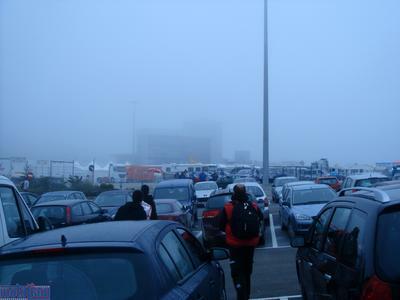 It really WAS super foggy on Saturday and Sunday morning. This was about 9AM and it just blanketed the entire area with thick, dense, soup. It took hours for this stuff to burn off on Saturday, so pretty much no one rode until after 1PM. This spaceship overlooks the end of the mainstraight. You can't really tell how cool it is from the videogames, but it's pretty cool. There's another big watchtower with a sign advertising, Don Pepe, which is pretty neat, too, and it's the restaurant located at the Hotel de las Cuevas, about five minutes from the track. Cuevas means Bunker, and true to the name, my room was below ground, with no windows. Just a 12" square grated airhole to the hallway between the rooms. Forgot to mention how different everyone's engine braking and traction control sounded going through turn 1. Ilmor definitely was the loudest. Those car guys have a really neat bike, but they're still learning the dynamics of how to get a motorcycle around the track. There's a lot more pitch and yaw than in a car, hahaha. Still, I'd like to see everyone competitive this year, so here's hoping they get it sorted. On another side, I can totally see Ilien working the 200cc piston development angle in the event that F1 goes to a 2 litre V10 format in the future. . . . .
We took some fancy pictures. Every night we stayed up late and played cards, or at least, whenever I'd get back to the hotel, Alex was up playing cards, hahaha. 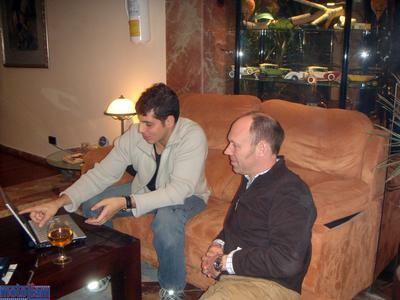 Tobey is cool as heck, had a lot of killer advice and stories for me, and yes, that is a GMT Master II he's wearing. "Look! There's MotoLiam's corrupted database website, where he can't upload or post anything cool!" Seconds later, I joined my flock. And this is how I felt about the IRTA Test. Hey Liam, I've got a question for you (when you get a chance!). How are the big semi trucks transported across continents and oceans? Thanks! 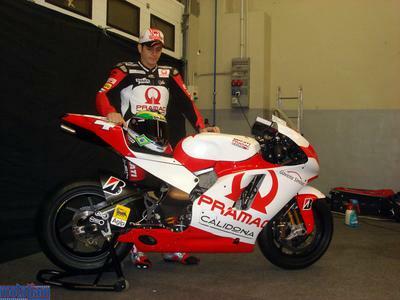 I'm loving the return of the white/red Pramac livery. Good luck in '07! In bocca al lupo!